It's disappearing cause no one will run it as the rules state. if your going to have to work on and tune it why not just race a tc class. This year's tcs race killed our class guys from other states come down and were running times as fast as the pro specs Spent all weekend working on a truck that should have needed no work or tunning my gt2 car and pro spec car was neglected cause I was trying to find the handling in my truck the trucks haven't been put on the track sense and that's a damn shame they were fun when it was throw it on The track and drive now it's a paperweight . I think it's sad to think that chasing a setup on race day is the main demotivator for dropping out of a racing class. It just sounds like a lot of sore losers who are unwilling to jiggle their brains or practice better driving, that will lead to their own success. Ultimately, it boils down to attitude. This shows a "can't win, don't play" attitude that will not grow our rc communities. Rc is, at the end of the day, a fun hobby ( and that's why manufacturers like Tamiya make new cars... In this case, trucks), where racing your friends is fun, winning is just a bonus. Don't get so serious. team green and scirocco14 like this. JCarr and Mark842 like this. Perhaps rc is a little different in America. We had some visiting drivers from the states for a local x-ray race and wow! They sure drive different! Personally, i​​​​​​ enjoy the setup part as much as kit building and racing. It all comes together as a full package. 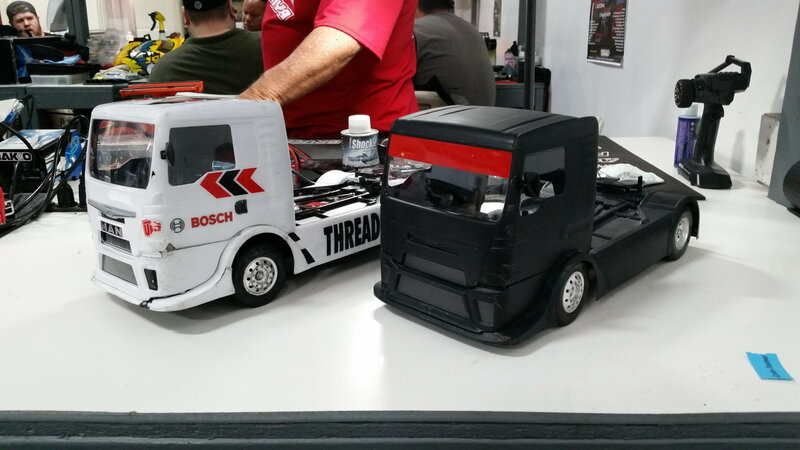 In Singapore, if we wanted to run a box stock class, it will be with pre-built cars... Usually for endurance races. But running a league race without expecting people to optimise their cars is not possible. Our hobby causes people to tinker, whether it's oiling bearings, saucing tires, dusting the dust off the car, or other kinds of fiddlage... It's inevitable! That's why it's important to provide a certain amount of fiddling leeway, so that our natural instincts to fiddle, doesn't become cause for poor sportsmanship. I’d be curious has to how different they drove. I believe you’d find RC racing very different here in the States. While there are some racing series in different states. It’s mostky local. And rules or what is ok can very from group to group. Depending on who’s racing the class. My understanding of the Euro truck class was for it to be an entry level class. Reasonable cost for someone to try racing. Unfortunately it didn’t seen to take long before the experienced drivers started running it, and wanting to make changes. Ran this class for the 1st time last Sunday in the Tamiya Race at NorCal Hobbies. There was 3 heats of trucks in qualifying , and a A and a B main.I wasn't planning on racing, but 3 days before the race, a friend offered up a loaner truck, if I finished assembly and painted the body. I had plans to do a simple paint job, just detail the chassis / motor, and a simple scheme for the cab ........ after spending 3 hours cutting out the body, the plan changed It ended up all black, and matt clear on the outside. It looked good and I was amazed at all the attention it got. The truck worked really well, I finished 8th in the A main. I found the trick for me was to turn down the steering and brakes as far as possible to minimize tipping over. These trucks are starting to take off locally, they are a good fun class for those sick of all the political bs that plagues the other 'sanctioned' classes, many of which have become nothing short of farcical with control motors set to a certain kv, just no fun anymore! We've set it so these trucks can be any servo, esc can be changed to the Hobbywing Quicrun brushed (as the stock unit we had a high failure rate) any battery, minimum weight 1550 grams, beyond that bearings and alloy prop shaft are only allowable upgrades. We do reverse grid after qualifying (so top qualifier starts last) and it encourages some good close racing but also it's about fun, so a few guys have horn modules, led's, sound units etc and the rules allow for people who are getting too full on about winning to be excluded from the class. What's killing those ESCs? I've never had a TBLE-02 die for any reason other than reverse voltage. From what we've seen, it's the BEC. One of my buddies went through 3 ESCs at the Snowbirds this year. I don't think the BEC in the stock ESC can handle some of the newer servos that draw a lot of current. I had what I thought was an ESC problem when in actuality was multiple motors. I would start a race and be fine for a lap or two before the truck slowed. I switched motors and again the truck would be great for a lap or two before slowing. Pull over for a minute and when starting again the truck would be fine for a lap and then slow down. I spoke to some people and they said the same thing as stated above. I was told that High Voltage servos were blowing out the BECs. I purchased a new non-HV servo and a new speed control. When trying trying the new speed control, I made one lap before the truck slowed. I ended up purchasing a new 3rd motor and that solved the problem. So before you go buy a TBLE-02 "Which is hard to fined aside from Tamiya USA for $80.00", try a new motor without doing any kind of break-in on it.